These restaurant week picks also have great kid-friendly food! If your mouth started watering the second you began browsing this summer's NYC Restaurant Week options, your next instinct might be to book a babysitter for an adult's night out—but there's no need! Though fancy dinners make great date ideas for parents, many of the participating eateries also offer kid-friendly fare in addition to the prix-fixe menu options. If your young gourmands are ready to expand their palates beyond New York pizza, make a reservation for the whole gang at one of these spots—a few of which even made our list of the 50 best family restaurants in NYC. At Blue Smoke, parents get to sink their teeth into some serious Southern cuisine ($25 for the prix fixe lunch, $38 for dinner) while your kids feel very grown-up with their tasty main course, side dish, dessert and drink ($11). We think the baby back ribs would go particularly well with grilled zucchini, root beer and a scoop of vanilla ice cream afterwards! Parents, satisfy your seafood craving this Restaurant Week at Blue Water Grill. For the mature palate, order a round of market mussels or West Coast oysters to start, and pan-seared tile fish for an entree ($38 for the prix-fixe dinner). Your kids may say “yuck” to shellfish, but they’ll love a mocktail ($3) to go alongside their pint-sized plate of free-range chicken fingers or grilled scottish salmon ($9). And don’t forget the dessert menu—order the kiddos a brownie-bite sundae and, for yourself, the market blueberry shortcake or dark chocolate sundae that’s included with your meal. You can’t go wrong with classic Italian food for you or your little food lovers—especially with a restaurant that’s been perfecting traditional Italian dishes for over a century. Whether you’re ordering yourself raw clams on the half shell or a pizza for the whole family to share, you’ll leave feeling happy and full. Parents can chow down on creative contemporary Thai dishes with Kin Shop’s prix fixe meal ($25 lunch, $38 dinner). Their menu has everything from kale and aquatic-vegetable stir fry and braised skate with calamari to kale-and-watermelon salad and passionfruit mousse. Plus, your pint-sized food explorer will love to share the sweet shrimp pad thai with you ($24) and crunchy roti on the side ($6). Chances are, your little ones have had enough mac & cheese in their time to know when it’s good. 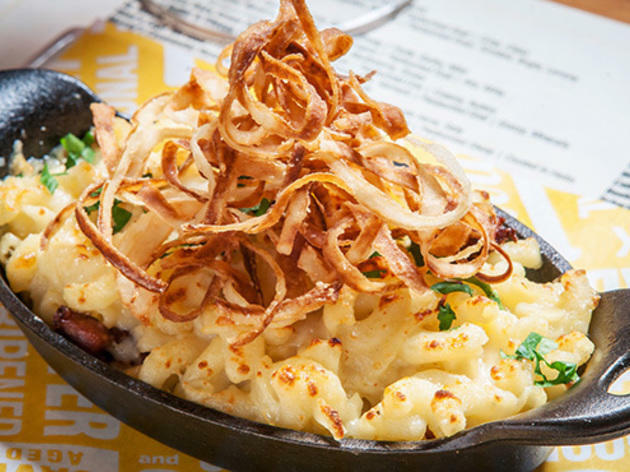 While the adults treat themselves to a fromage flight and a rarebit burger or wedge salad ($25 for the prix fixe lunch), kiddos can chow down on some of the yummiest, gooiest and cheesiest mac & cheese in the city ($12). Share a dessert from the prix-fixe menu with the youngsters—choose from options like a chocolate hot pot or summer peach pie—and the whole family will sleep well with full bellies. Ruby Foos’ menu is filled with classic asian dishes, for little ones who adventurous tastebuds. With the $38 prix fixe dinner, parents can try the salmon tartare with watermelon, avocado and yuzu, the (spicy) softshell crab bao buns and perhaps a glass of Chenin Blanc. If your mini-me is on the feeling brave, order her some pork spare ribs with sweet & sour sauce—if not, there’s always the grilled cheese and fries as a backup ($12.95). 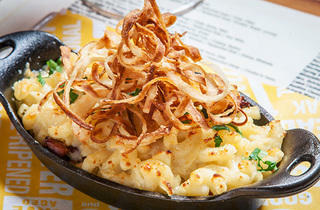 If Sarabeth’s wasn’t already a family favorite, it sure will be once you stop by for Restaurant Week. Opt healthy with the summer chicory salad and vegetable quinoa bowl (but treat yourself to grilled peaches & shortcake) for the $25 prix fixe lunch, and order lemon & ricotta pancakes that your kiddo will gobble up, blackberries and all ($18.50). Afterwards, work off your meals with an afternoon spent playing in Central Park!